There are many more things to see at Udaipur, but we decided to make a day-trip to Mt. Abu, on the second day. It was a long drive, but the roads were pretty good for the most part. Hence, it was a good choice for the trip in the middle of the 3 days at Udaipur. After break-fast we headed out. Enroute we were informed of the bandits/tribal trouble that occurs in the night time along that highway. The cab drivers suggested that we either return before sun-down or stay over night at Mt. Abu. We thought it was not worth the while to spend lot more time at Mt. Abu. We took in regular sights of Achalgarh temple (skipped the fort), Dilwara Jain temple and Arbudha Devi temple. The Dilwara Jain temple is pure artistic marvel - amazing sculpture on pillars, ceilings, walls - pretty much all around. Symmetry, eye for detail, and variety of patterns from tile to tile (very little repetition - and only when required for symmetry). Since photography is not allowed in most temples, we did not click any throughout Mt. Abu! Next was the climb to Arbudha Devi temple, which was about 450 steps and did take a while to make it. One has to bend / crawl below a huge boulder to get into the sanctum - even more difficult for tall and fat people like me! It was worth it - as we had a good exercise before lunch. We took lunch at a small vegetarian restaurant before we went for a boat trip on Nakki lake. It was casual pedalling around the small lake in the cool afternoon sun, taking in the greenery around the lake. Then, after some shopping for souvenirs we headed back to Udaipur. The third day was spent in further exploration of Udaipur. First stop at the zoo was for about an hour - and we wondered how they would maintain these in the peak of Rajasthan's summer. It must indeed be difficult to maintain, but I guess the lakes are good enough to provide the water, and some greenery to Udaipur. 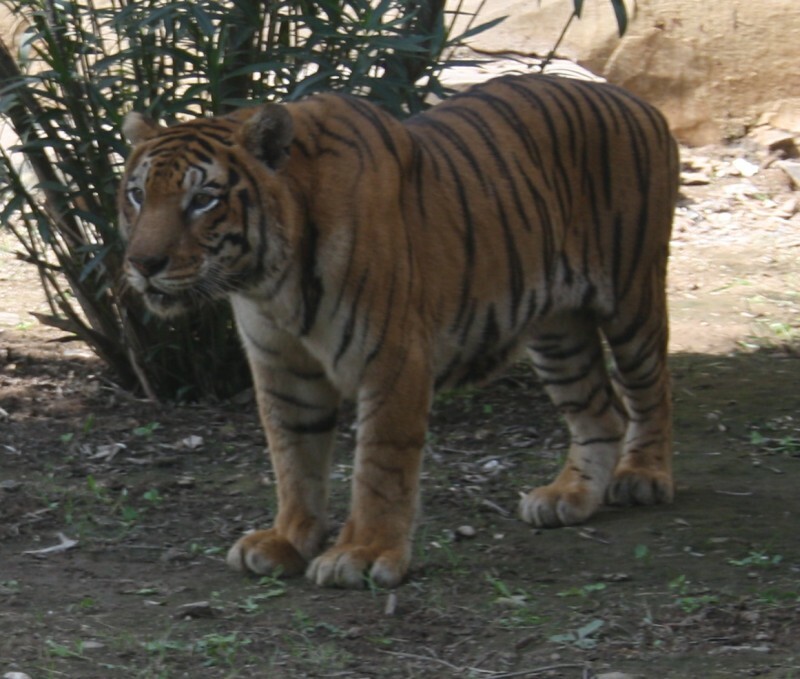 The whole Gulab Bagh area is full of greenery and the zoo tucked into a corner. Then a stroll around the Gulab Bagh area, including a view of the Gulab Bagh Library, was pretty relaxing. Fateh Sagar lake view was taken up next - but no boat rides on that day - the lake was over-flowing. The road around the lake would have been submerged if there was 3 inches more water in the lake. So, we took some photos of the full-to-the-brim lake before heading up to Moti Magri (Pearl hill) to see the museum and Maharana Pratap statue commemorating the Battle of Haldighati. The view from this hill was very nice too. We drove along the lake, upto the spillway of the lake, before heading down to an architectural marvel 'Sahelion ki badi' (garden of the queen's friends). 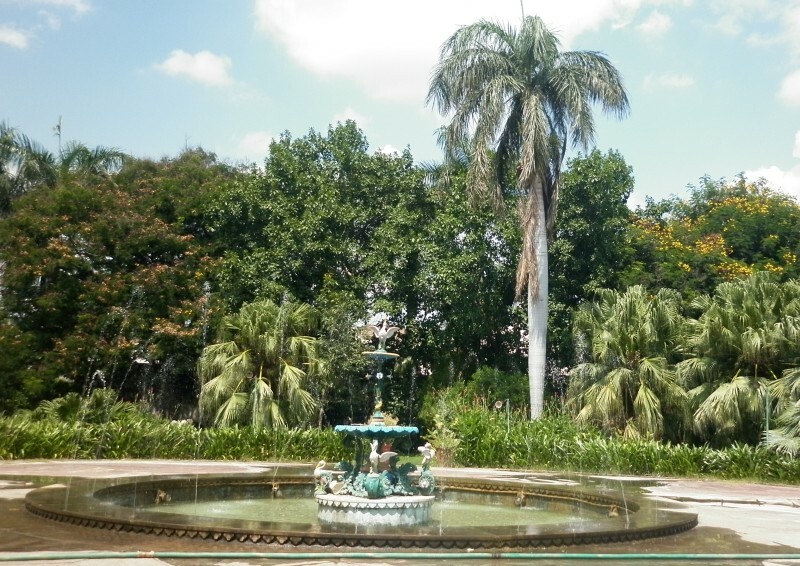 This garden contains many fountains, which function without a single pump. 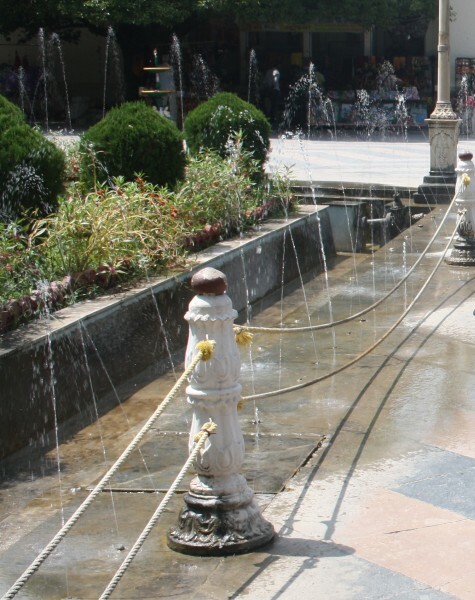 The garden and fountains are about 85 feet below the level of the Fateh Sagar lake (as per the guide). 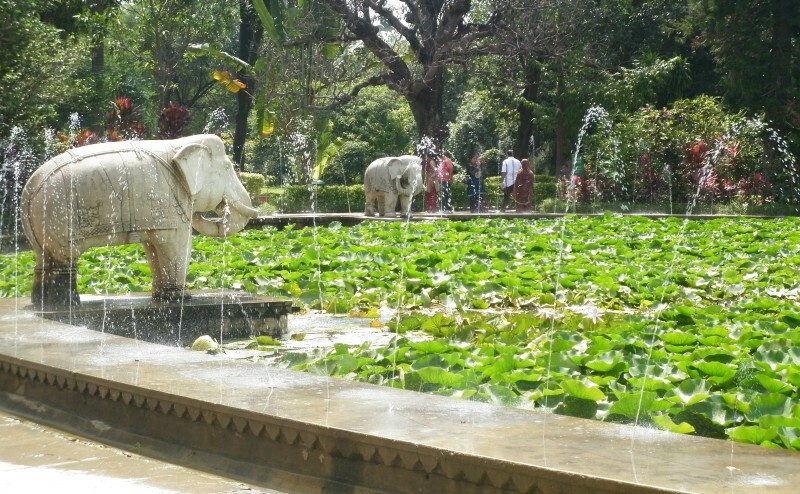 The fountains are directly linked from the lake and the water-head makes it function without any external effort of motors / pumps. Variety of layouts with different fountain patterns surrounded by a botanical garden was a real pleasure to enjoy. One wondered whether this is supposed to be part of Rajasthan desert in the first place! Probably not - just the border, maybe? The rest of the evening was spent in relaxation and shopping for a variety of things. Clothes, bedsheets, trinkets - bought a few of these, here and there - as per the cab driver's suggestions, after avoiding the main markets totally. He advised us that the main markets make hefty profits on tourists. As I have mentioned in a separate post earlier - the courtesy of the people, and the shopping experience was amazing. We are drawn to pull out our wallet and empty it at every shop! The politeness and willingness to serve was a contrast to the metro snobbery (majority of places in metros where customers are treated with disdain). Overall, it is worth a more relaxed visit - probably on someone's sponsorship to stay at those fancy 5-star hotels or the Taj Lake Palace! :-P Temple visits would also be worth it, along with some more shopping. So, travel donations anyone? As a general rule I seriously will likely not make comments on web sites, nonetheless I will need to indicate which the post genuinely pushed me to do so. Really fine post. There are various Tourist places in Udaipur worth visiting, tourist attractions in Udaipur. Visitors are should visit at least single time during their Udaipur Tour. I am sure once you see the tourist places then you wished to come again and again. Its nice to visit. The Lake Palace is one of the most beautiful palaces in the world udaipur tourism :The city of Udaipur is a lovely and beautiful land around the water lakes and lush hills of the Aravails. India is a very beautiful country. Each part of the country is blessed with marvelous natural beauty.Rajasthan is the biggest state of India with stunning metropolis Jaipur as its capital. Tourist across the seas comes here to visit the amazing location and for many travelers who prefer to stay at Lake City Resorts in Udaipur. Rajasthan Tour Packages on BlogSpot plus your blogs designing in addition superb. As eyes caching at the same time beautiful destination situate in India there’s culture can also be min blowing along with chronic historical getaway available. Really thanks nice information. i have read your information on Rajasthan article with your blog-spot with deal of Rajasthan tour package. It’s amazing holiday trip in order to make plan. Genuinely thanks for shearing. Mount Abu and Udaipur, both are amazing tourist destinations and offers beautiful views. Plenty of places to visit in Udaipur make it worth visiting and is one of the beautiful city in Rajasthan. Hey nice post. Mount Abu has the highest peak in Rajasthan's Aravali range, the Guru Shikhar. The lush greenery, sparkling water bodies and delightful wildlife makes for a refreshing change of scenery from most other parts of Rajasthan. Check all best places to visit in Mount Abu.